Hands-on in approach, this innovative book presents thorough coverage of the fundamentals of electronic design, fabrication, and documentation, PLUS a complete experience in creating electronic prototype devices. Features three levels of fabrication projects: A Sample Project (Variable Power Supply) -- carried from chapter to chapter, with step-by-step guidance -- starting with the two-step design process and ending with a completely packaged and tested prototype project, along with necessary documentation. The Exercise Project (3-Channel Color Organ) -- carried from chapter to chapter, with less step-by-step guidance. 25 Elective Projects -- where readers construct a device for which only Concepts and Requirements Documents and circuit design sketches are provided. 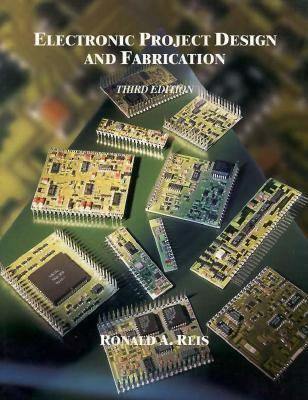 Offers unique coverage of surface mount technology -- from an introduction to the subject, through project design and fabrication using surface mount technology, to rework and replacement.Reis, Ronald A. is the author of 'Electronic Project Design and Fabrication' with ISBN 9780023992933 and ISBN 002399293X.